Next Friday, the BBC show to choose a UK contestant, Eurovision: You Decide, is taking place at the BBC studios in Salford. We are calling on the artists and media workers not to support the contest. There will be a protest rally from 16:00 until 19:00 outside the venue with Palestinian music. Join the protest on Friday 8th January outside BBC studios. The studios in MediaCityUK in Salford less than 15 minutes from Manchester city centre by Metrolink tram. 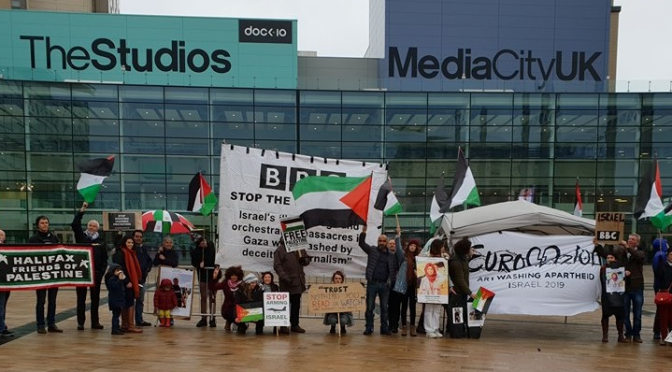 Signing and share the petition calling on European broadcasters to withdraw from Eurovison 2019 and for songwriters and performers to boycott the contest hosted by Israel just as they once boycotted the apartheid regime in South Africa. More information on the campaign from bdsmovement.net.